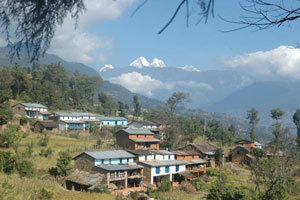 Nepal is one of the world’s premier adventure travel destinations. 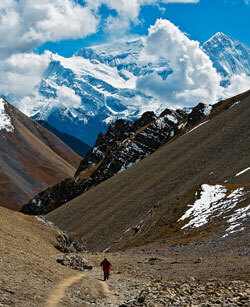 Nepal’s trekking options are endless. Rivers wind down the snow-capped mountains, creating some of the best river rafting and kayaking opportunities in the world. Discover the traditional architecture and holy temples in Nepal’s ancient cities to learn more about the country’s fascinating culture. Nepal is about 54,363 sq miles with a population of approximately 30 million. 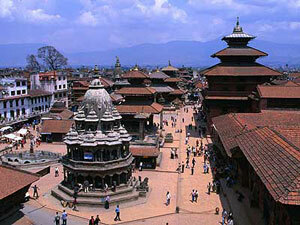 The largest city, with more than 1 million people, is the capital, Kathmandu. Many visitors, drawn to Nepal by the unique eco tours, leave equally enchanted by the friendly demeanor of the Nepali people. Nepal is one of the best budget destinations around the world. The greeting in Nepal is Namaste or Namaskar, which is done by bringing your palms together a few inches below your chin and facing them upwards and slightly bowing your head. Namaskar is used in formal conversation while Namaste is used in informal conversations. Namaste is both a gesture and spoken greeting. It can mean hello, how are you, have a nice day, and good bye. Punctuality is not of high importance in Nepal. Often public buses don't run on time, and road traffic is unpredictable. Plan accordingly and be prepared for delays. Public displays of affection such as kissing may be offensive to some. When signaling agreement, shake your head from side to side and when showing disagreement, nod your head up and down. Pointing your finger at someone is considered rude. If you need to point at someone, use your upturned hand or point your chin at the person. Do not point your feet or the soles of your feet towards anyone, as this will most certainly cause offense. The dress code in Nepal is conservative. Women, especially in villages, cover their shoulders and legs, so shorts and tank tops for women may be considered inappropriate. Like in many countries around the world, you should remove your shoes before entering a temple or someone’s home. Ask for permission before entering a Hindu temple. Taking photographs inside most temples is not allowed. Please ask for permission before taking photographs of objects, and the Nepali people. Always walk around stupas in a clockwise direction. Nepal has a very tolerant attitude towards religion, and many different beliefs and practices are accepted and flourish. Leather products, such as belts, jackets, shoes, and bags are not allowed in most Hindu and Buddhist religious places. For religious reasons, you should never touch the head of a Nepalese individual. A popular Nepali dish is momo, which is much like the Chinese dumpling. A typical Nepali meal consists of rice, lentils, meat, fresh vegetables and pickles. The raksi is a traditional distilled alcoholic beverage from Nepal. It is made out of beaten rice. However, only try a little because it is a very strong and burning drink. When eating in Nepal, its is proper etiquette that you do not handle anybody else's food, that you only pass food containers with your right hand and that you do not eat from anyone else's plate. Tipping is appreciated in tourist restaurants. Around 5% is fine in cheaper places; around 10% is fine in more expensive restaurants. Round up the fare for taxi drivers. Eight of the fourteen highest peaks in the world are in Nepal. Besides the tallest (Mt. Everest), there are still about 236 different peaks currently available for climbing and trekking. Trekking is not the only activity which draws visitors. Nepal also has some superb white water rafting, mountain biking, and elephant jungle safaris in Chitwan National Park. The best time to trek is the dry season from October to May. Nepal has four distinct seasons. Spring is from March to May, and is typically warm with rain showers. Summer, from June to August, is the monsoon season when the hills turn lush and green. Autumn, from September to November, is cool with clear skies and it’s the most popular season for trekkers. In the winter, from December to February, it is cold at night, with fog in the early morning. Whether you’re looking to plan an adventure travel vacation or simply relax and soak up the culture, we can help you find the perfect Nepal eco lodge. To learn more please fill out a custom tours form or call us at (866) 577-2462! Do you have any Nepal travel tips to add?